Hello everyone! I have fallen in love with another nail polish! This one is L’oreal’s 116 Macaroon Me Madly from the Versailles Romance Collection that came out 2 years ago (you can still find it on Amazon). It is one of their Colour Riche Nail Colors that comes in a variety of other shades and retails for $4.79-$6.29 depending on the shade. I think “Macaroon Me Madly” is such a perfect shade of pink that is not too light & not to “bubblegum-ish”. I wore it to an interview & definitely think it passes as a business-appropriate color. This polish without a top coat lasted me about 3 days before it started chipping- so not great but not bad. 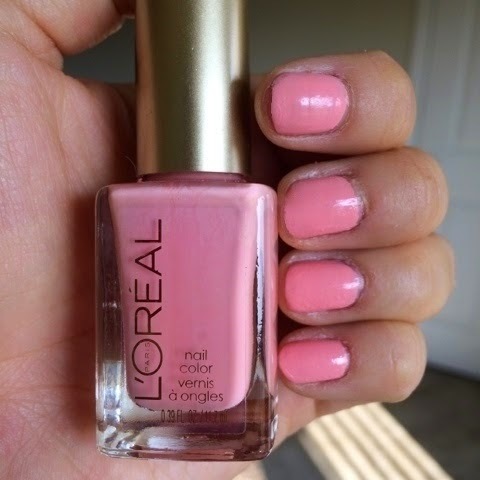 I definitely recommend this color to you though if you like a creamy pink color! OOTD: Dark Florals + New Shoes!